The combined debit card transactions of these three payments Bank in August 2018 was reported to be 2.15 million. 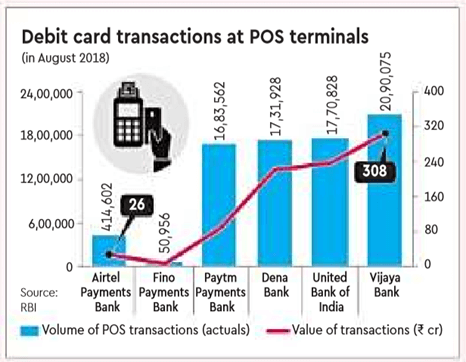 The monthly volume of Debit Card POS transactions of Paytm Payments Bank has already shown a great momentum against the smallest PSU Banks, in less than a year’s period of commencing its operations. Paytm Payments Bank had received some adverse observations from Central Bank on the customer on-boarding process. FINO Payments Bank was observed to be having accounts with more than Rs.1 lac balance which was against the stipulations of RBI. Out of the three payments bank referred above, though Paytm Payments Bank was the last one to be launched, it has surpassed the other two and mustered more accounts, since it could get the larger number of transacting customer from the migration of its existing wallet users. They are expected to capitalize on other resources of revenue which mainly is through customer transactions. The thin margin in the revenue has already forced the other takers like Tech Mahindra, Cholamandalam Investments and Finance and Dilip Sanghvi surrender their in principle licenses for launching a Payments Bank. Aditya Birla Idea Payments Bank and Jio Payments Bank are yet to launch full-service consumer operations. The Payments Bank promoted by National Securities Depository (NSDL) is yet to be launched.